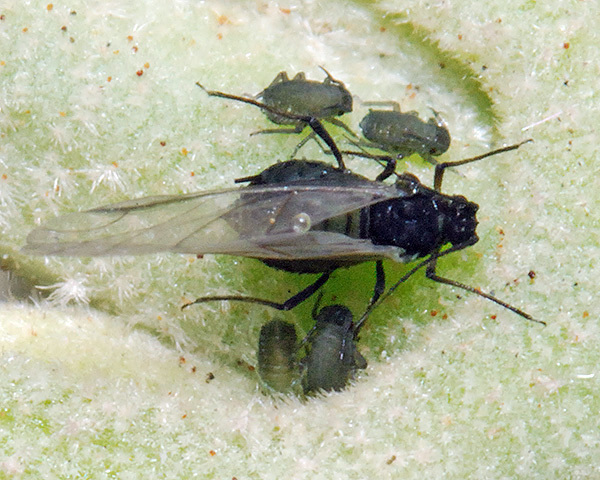 The aptera of Aphis lantanae is dark greenish-brown, and is not wax-powdered (see first picture below). Larger specimens have dark bands across tergites 6-8 and shorter bars on some or most of the other tergites. Their cauda is rather short and bluntly tapering. The body length of apterae is 1.5-2.1 mm. The alate of Aphis lantanae (see second picture above) has similar dark bands across most tergites as well as well developed marginal sclerites. 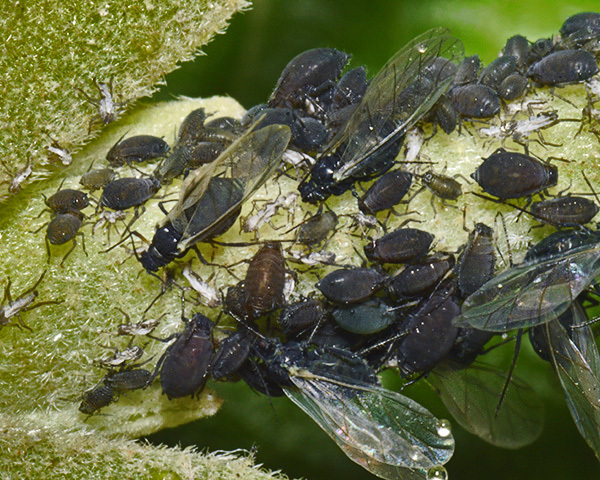 The wayfaring tree aphid does not host alternate. It feeds on wayfaring tree (Viburnum lantana) living in curled leaves, on young stems or under senescing leaves. 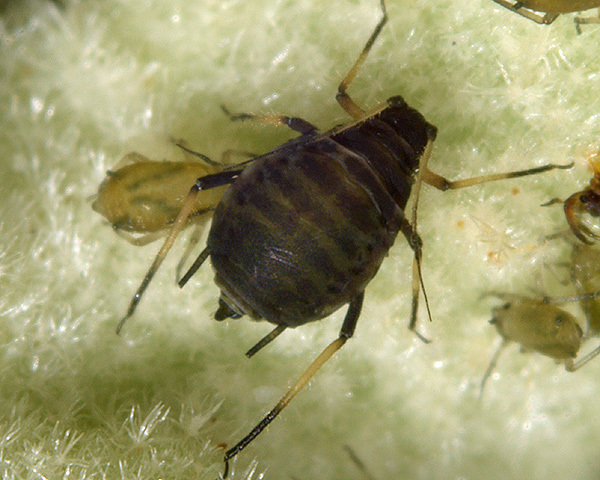 Aphis lantanae is a local species in Britain previously only recorded in Kent and Hertford, and now East Sussex. In continental Europe it has been found in France, Germany, Switzerland, the Czech Republic, Austria and Italy. 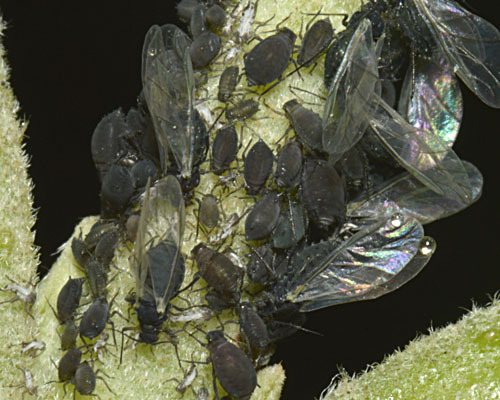 Our observations are the first records of Aphis lantanae in East Sussex. 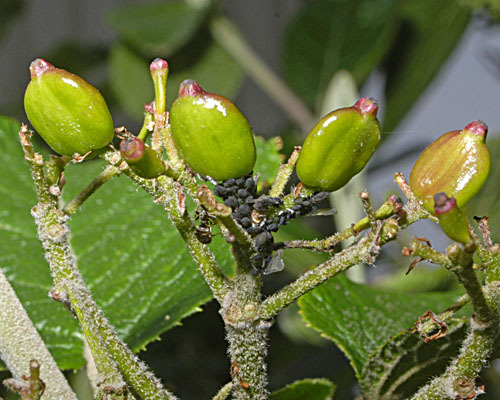 Aphis lantanae probably occurs in most places where its host, the wayfaring tree, is found. We have found it in two nearby locations on the South Downs in East Sussex. 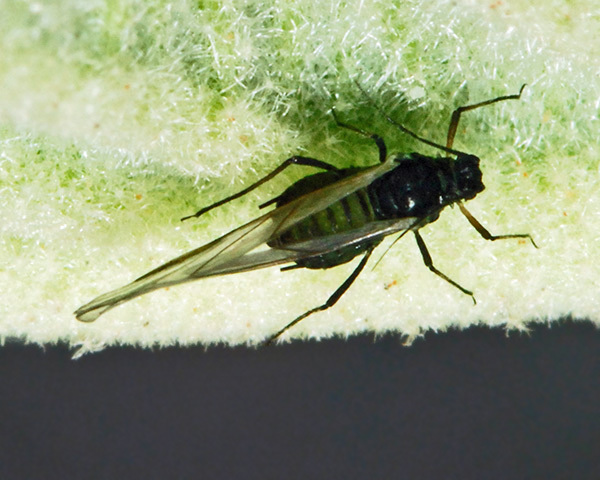 In one instance an alate was found larvipositing on a leaf. Each colony comprised a mixture of apterae and alates (see picture below). As far as we know, no research has been carried out into the ecology of this species. On the taxonomic side, Jorg & Lampel (1995) carried out vertical starch gel electrophoresis of members of the Aphis fabae complex including Aphis lantanae to find specific isozymic characters. Each of the 18 taxa investigated could be clearly identified by analysis of the banding patterns of 17 genetic loci. We especially thank Plumpton College for their kind assistance, and permission to sample.